Download "RAID. Tiffany Yu-Han Chen. 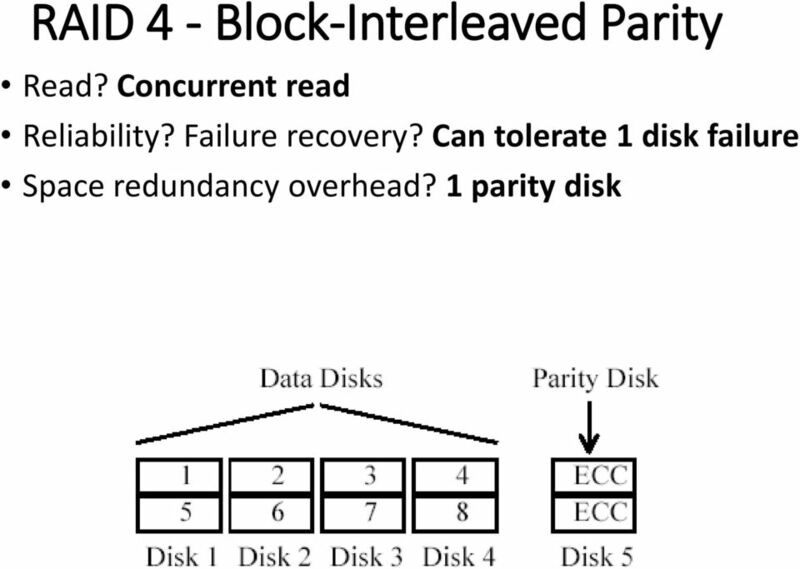 # The performance of different RAID levels # read/write/reliability (fault-tolerant)/overhead"
2 RAID 0 - Striping Strip data across all drives (minimum 2 drives) Sequential blocks of data are written across multiple disks in stripes. 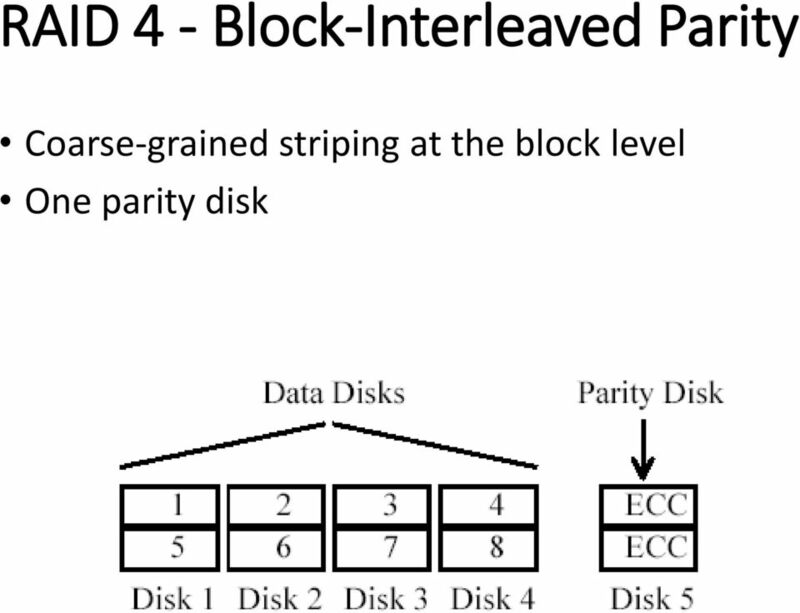 3 RAID 0 - Striping Strip data across all drives (minimum 2 drives) Sequential blocks of data are written across multiple disks in stripes. Read/write? Reliability? Failure recovery? Space redundancy overhead? 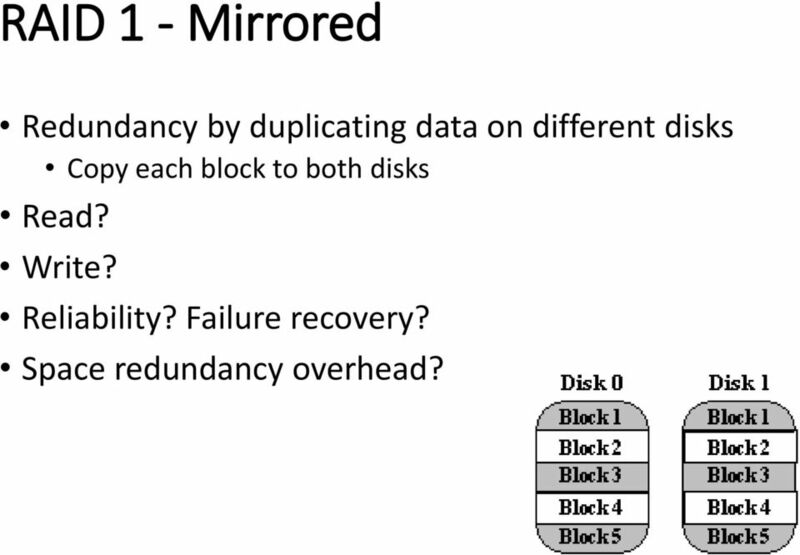 6 RAID 1 - Mirrored Redundancy by duplicating data on different disks Copy each block to both disks Read? Write? Reliability? Failure recovery? Space redundancy overhead? 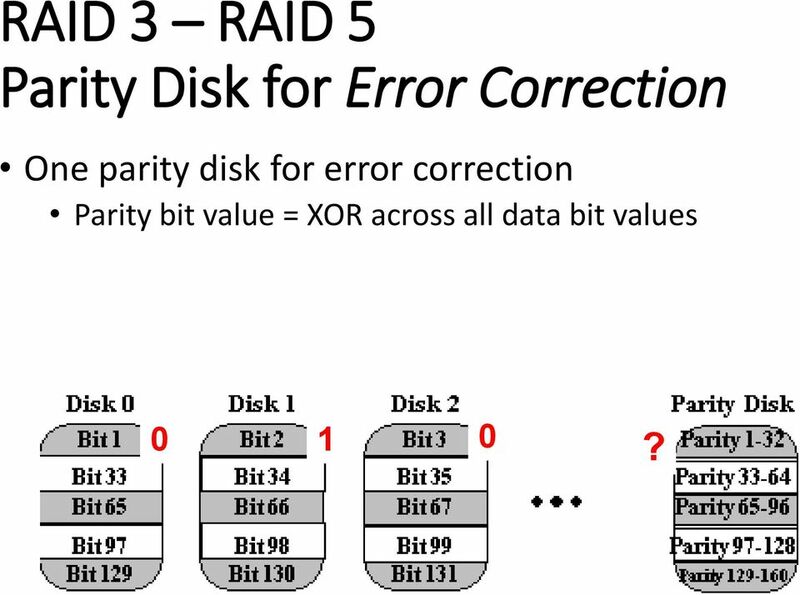 9 RAID 3 RAID 5 Parity Disk for Error Correction One parity disk for error correction Parity bit value = XOR across all data bit values 0 1 0? 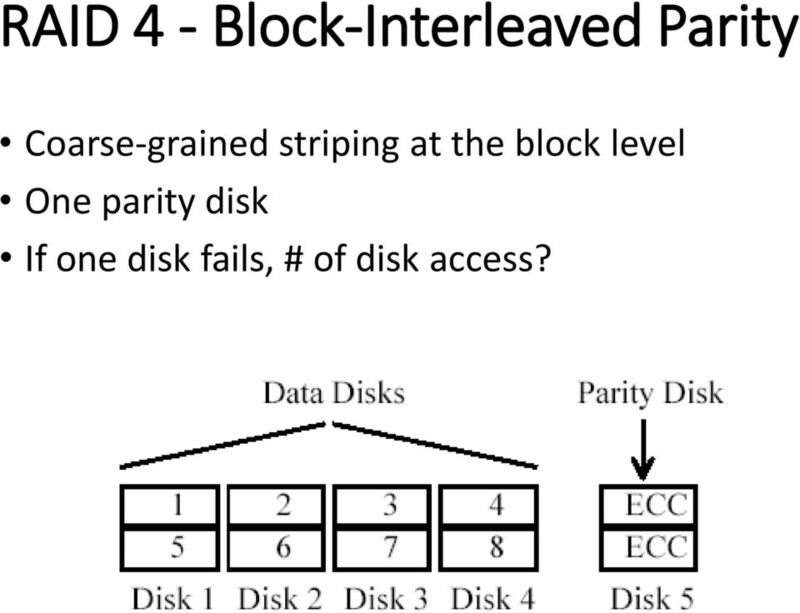 12 RAID 4 - Block-Interleaved Parity Coarse-grained striping at the block level One parity disk If one disk fails, # of disk access? 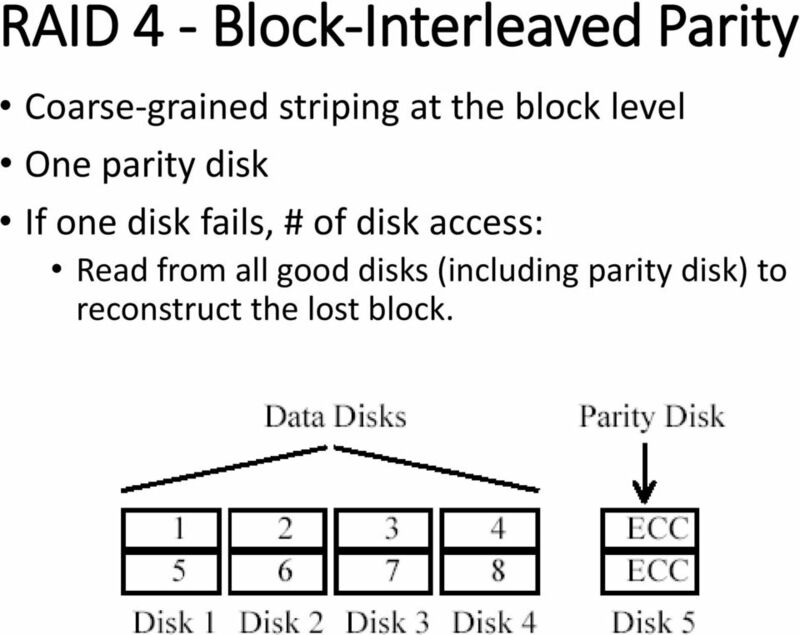 13 RAID 4 - Block-Interleaved Parity Coarse-grained striping at the block level One parity disk If one disk fails, # of disk access: Read from all good disks (including parity disk) to reconstruct the lost block. 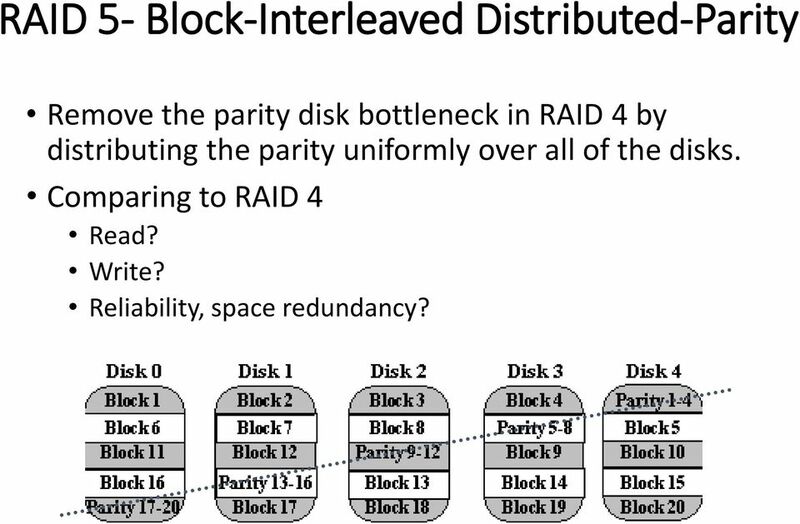 14 RAID 4 - Block-Interleaved Parity Read? 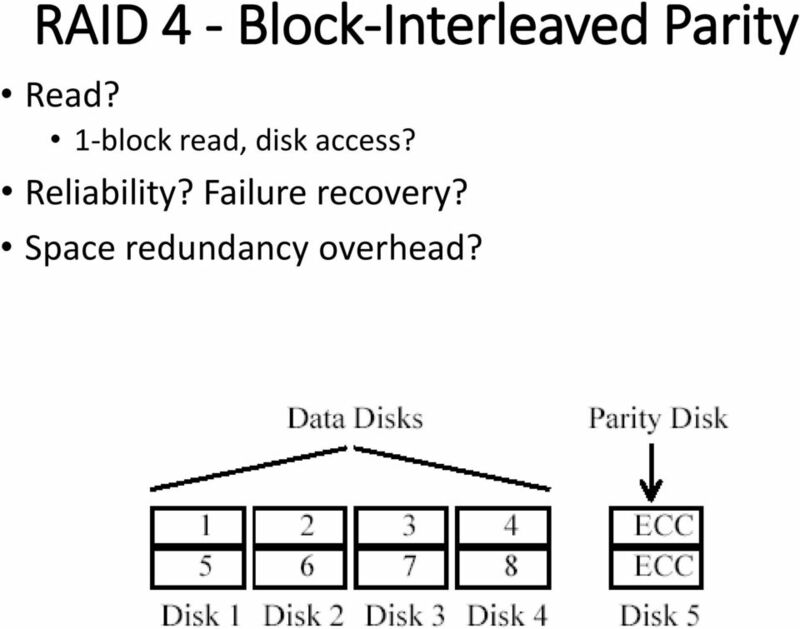 1-block read, disk access? Reliability? Failure recovery? Space redundancy overhead? 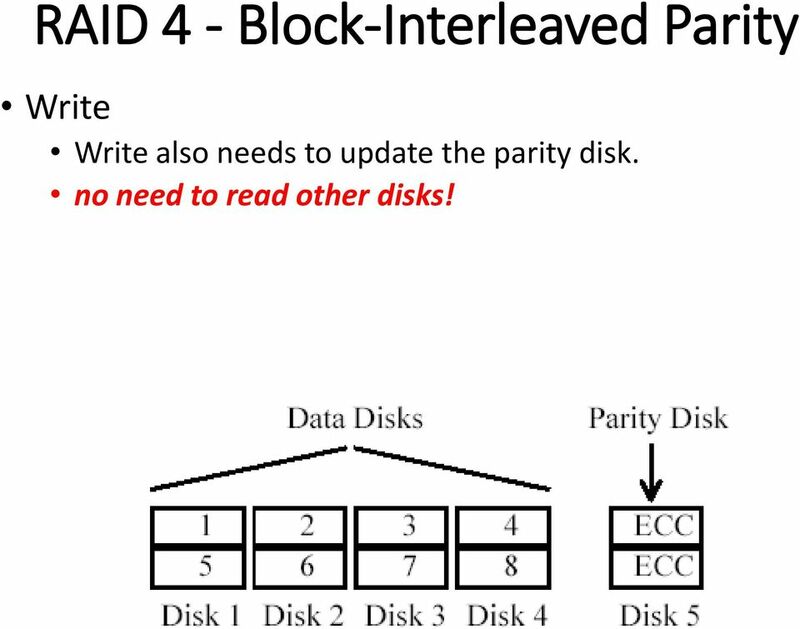 16 RAID 4 - Block-Interleaved Parity Write Write also needs to update the parity disk. no need to read other disks! 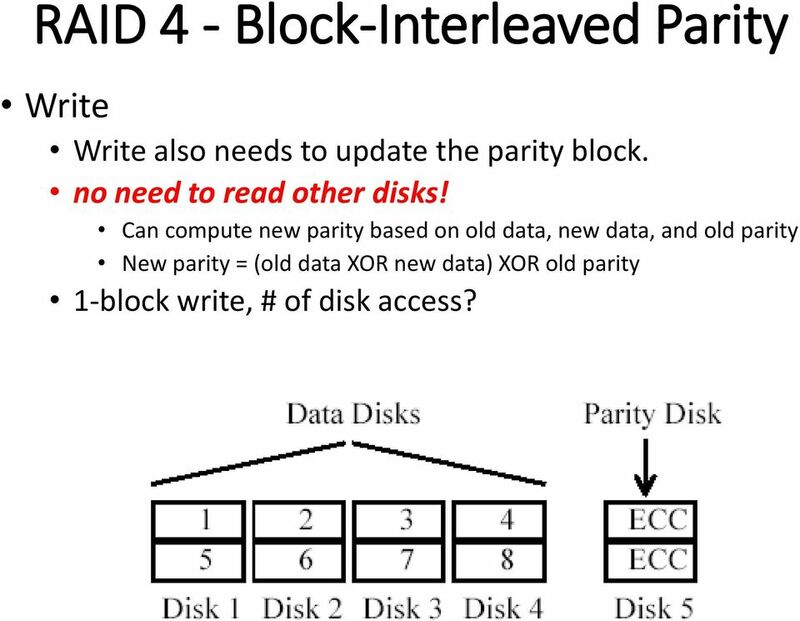 17 RAID 4 - Block-Interleaved Parity Write Write also needs to update the parity block. no need to read other disks! 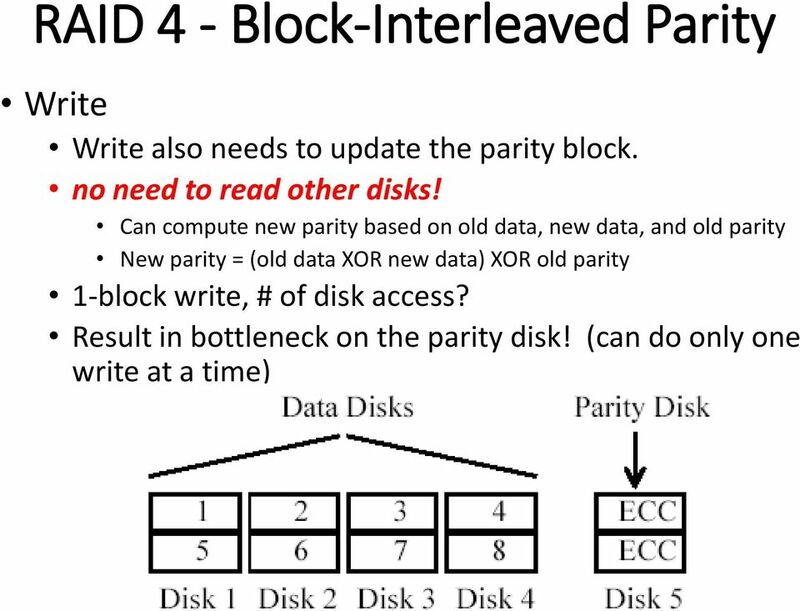 Can compute new parity based on old data, new data, and old parity New parity = (old data XOR new data) XOR old parity 1-block write, # of disk access? 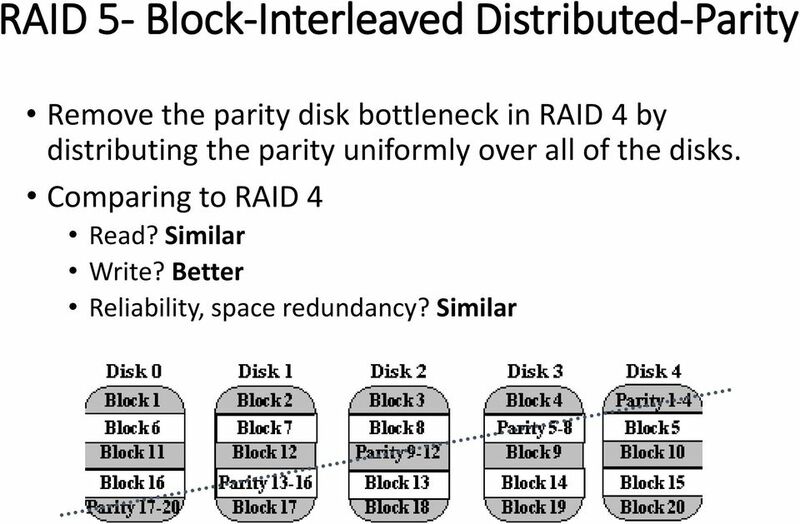 19 RAID 5- Block-Interleaved Distributed-Parity Remove the parity disk bottleneck in RAID 4 by distributing the parity uniformly over all of the disks. 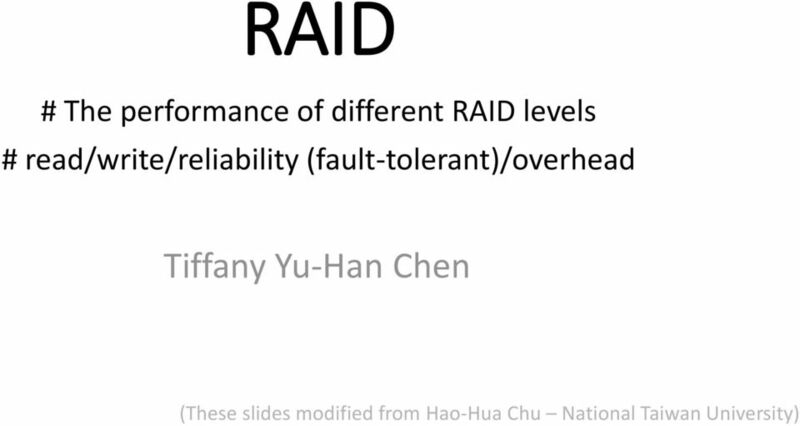 Comparing to RAID 4 Read? Write? Reliability, space redundancy? 28 Architecture Single master Multiple chunkservers 1. 29 Architecture Single master Multiple chunkservers 2. 30 Architecture Single master Multiple chunkservers 3. 31 Architecture Single master Multiple chunkservers 4. Operating Systems. 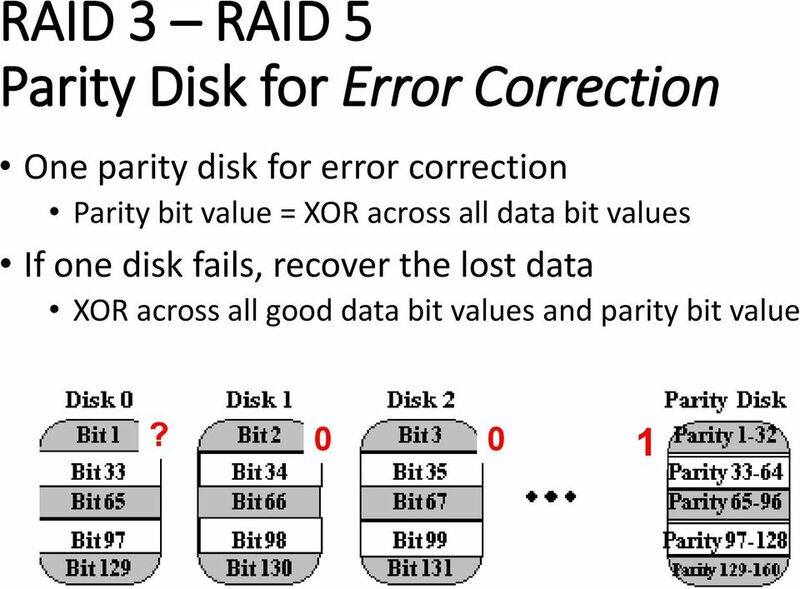 Redundant Array of Inexpensive Disks (RAID) Thomas Ropars. 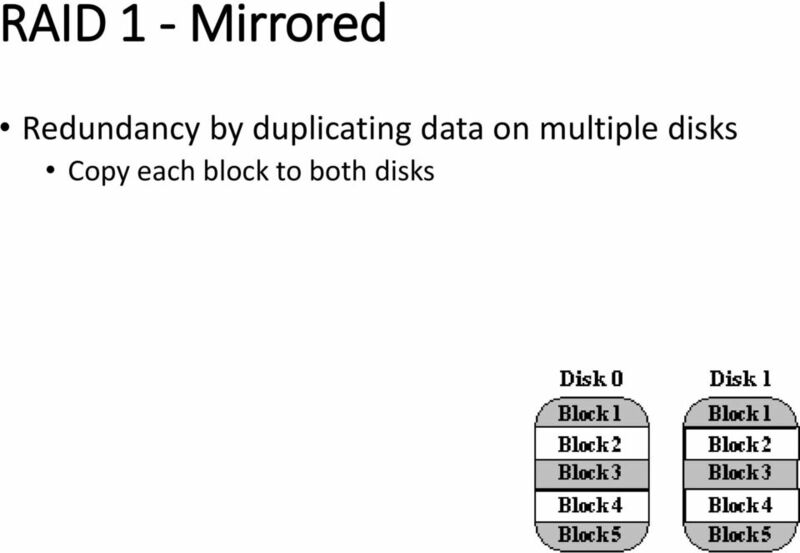 Parallel IO. Single namespace. Performance. Disk locality awareness? Data integrity. Fault tolerance. Standard interface. Network of disks? OceanStor 9000 InfoProtector Technical White Paper. Issue 01. Date 2014-02-13 HUAWEI TECHNOLOGIES CO., LTD.
Quantcast Petabyte Storage at Half Price with QFS! 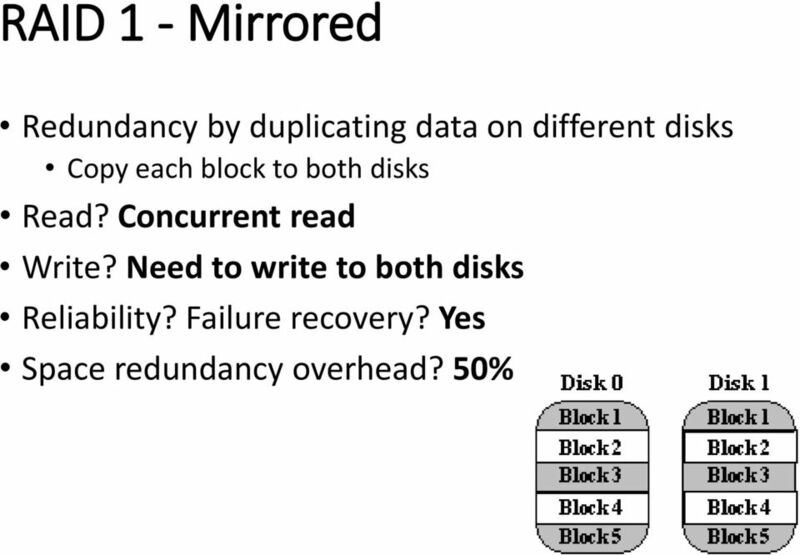 ECE590-03 Enterprise Storage Architecture Fall 2016 RAID Tyler Bletsch Duke University Slides include material from Vince Freeh (NCSU) A case for redundant arrays of inexpensive disks Circa late 80s..